Designed for dealers and car traders, Fastback UV is a solution that allows you to swiftly and efficiently manage your UV stock. It also allows you to print out all necessary documents related to car sale as well as windshield posters. 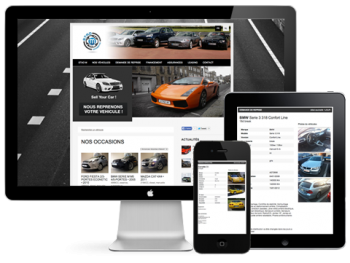 Fastback UV has a multilingual interface which can be used by one or several dealerships and which incorporates your own website. You easily create, publish and manage content intended for the latter as well as for social networks and specialized sites. You search for cars based on specific criteria such as make, model, year of construction, odometer indication or maybe fuel type. You are automatically alerted by mail when a stock entry was made for a vehicle that corresponds to the criteria one of your clients desires. Never miss a car sale opportunity again ! By using our CMS Fastback, you create relevant content (documents, picture’s, etc.) in all simplicity and subsequently share it with your clients and visitors. Our CMS’s additional advantage is the publication of your offers on social networks and on the specialized sites such as Autoscout, 2eme main or Gocar. With our application you will boost your visibility on search engines and social networks ! Our application keeps you easily accessible for purchase or sale and for obtaining additional info about your offers. Designed by professionals in the automobile sector, our Fastback UV will offer many advantages. Its ergonomic design will let you set up the platform completely autonomously so it will fit your needs. Simple in use, it will allow you to save time managing used car stocks and performing your sales. Moreover, you will be reactive following up on your sales thanks to the share function towards car traders, social networks and specialized sites. Our application’s performance is our prime concern. To this effect we are committed to offering you innovative solutions that answer the automobile sector’s needs. You wish to add a specific function ? We are at your disposal. Fastback UV allows you to simply and easily manage your new and used vehicle stock for all your dealerships on one single interface. On this interface, you enter the technical data, your vehicles’ equipment lists and the photo’s that will be automatically adapted to web format for rapid display. With Fastback UV it’s no longer necessary to connect to each automobile-ad site. With a single click our application handles the publication of your ads on the sites of your choice (Autoscout, Gocar, Autolive, Kapaza, etc.). With Fastback UV you posses all necessary tools to manage your billing. create detailed bills and credit notes. You’re all set to answer any requirement necessary to comply with the ISO standards in your dealership or sales point. Your data, files, email exchanges and other documents are centralized in one database saved on our secured servers. No more loss of data ! You generate subscriptions to your newsletter that will increase your prospect database. You easily and in total autonomy manage the platform set-up. However, should you encounter difficulties or should you have any questions, our tech support is at your disposal, fully complimentary, 6 days a week from 9 am till 5.30 pm. By using our solution for automobile trade you quickly sell off your UV stock and your trade-in vehicles. Thanks to an overall picture of the received bids you can rapidly decide which trader you want to seal the deal with. No more money sleeping in your parking lot ! You access the application where and when you wish from any device (computer, tablet, smartphone). You manage files and follow up on your company’s activity from your home or from abroad in total security. Our Fastback UV application was designed and developed by professionals in the automobile sector to facilitate managing and selling off UV stock. With our application you perform reliable expertises based on data sheets that allow you to directly modify the price of your offers. You save time thanks to the centralization of your purchases and sales on Fastback VO. With a few clicks, you directly access the content of your motor pool and the available offers on the market. Our support is fully complimentary. We are at your service and at your disposal 6 days a week from 9 am till 5.30 pm by mail or by phone. Manage your new vehicles (NV) stock as well as your commercial campaigns and other premiums given by the importer. You also wish to sell your customer’s trade-in vehicles ? All possible with Fastback Extended ! Contact one of our sales representatives to apply for a demonstration. By submitting this form, I agree that the information entered will be used as part of the free demonstration application and the commercial relationship that may result and for direct marketing purposes.